Christmas day started at around seven o clock because I needed to feed Edie. Craig went and woke his mum and dad so we could all go in and watch Freya open her first ever christmas stocking. She seemed a little unsure but soon got into the swing of things with a 'magic' wand, a dust pan and brush, a gold reindeer (she was surprised and delighted to find out that this was chocolate a few days later) some chocolate coins and a satsuma - of course. Here she is in her new Christmas 'Charlie and Lola' pyjamas with terrible bed head. We all trooped downstairs. Our living room was cordoned off to wait for my mum and dad at about 10.30. We lit the fire in the middle room and had a couple of brews. At one point I had some nice quiet time breastfeeding Edie next to a roaring fire - lush. This last picture is actually in the pub on christmas eve on our way to see Nic and Nick. Mum and dad arrived and we cracked open another bottle of cava after I had spent a frantic five minutes finding my christmas wine charms. One year, in the future I will have all the glasses washed and prepped on a silver tray the night before. With two children under two to contend with, I felt we were lucky not to be drinking out of dirty mugs. Time was marching on and Craig started to worry that he would have to start cooking dinner so we unleashed the beast. All in all, I think she 'got' the Christmas experience. She opened her first toy and wanted to play with it and then wasn't really interested in opening any more presents after that. The adults then spent their time trying to remove restraining clips/ties from madam's toys and clearing wrapping paper. Us opening our presents seemed to be unimportant. Craig had bought me a Kindle, he was convinced I had seen the packaging but I had obviously been too sleep deprived to notice it. It had not been something I had considered for myself as I am a bit strapped for free time at the moment and I hadn't considered getting one for Craig as he hadn't been doing an awful lot of reading lately. It was so great to have a gadget to play with though. I felt sorry that I had got Craig a leather travel bag, although he wanted one, you can't play with it. Freya ended up getting two farms from Pat and Ray which made us giggle. Pat hadn't realised that she'd done it until we opened both of them. 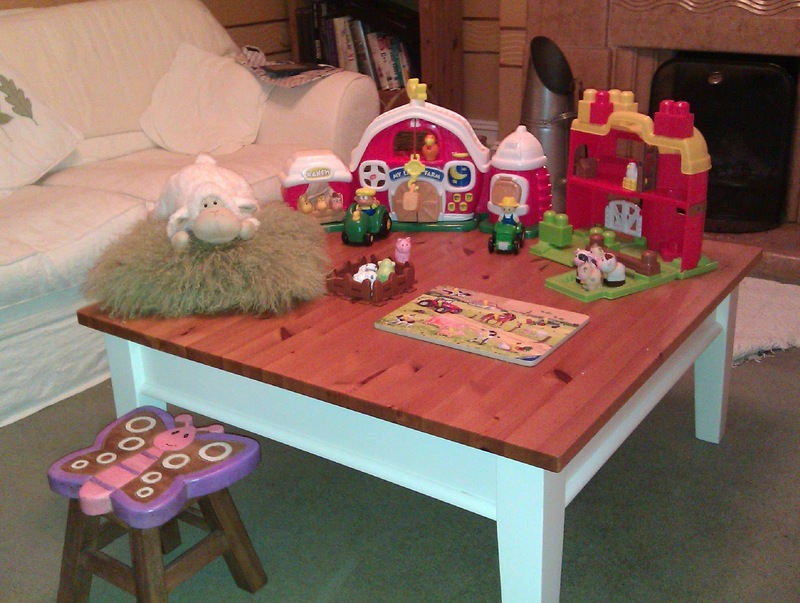 It worked out really well though, as she now has a large farm 'complex' set up on the low coffee table that keeps her busy for hours. This is perfectly complimented by a wooden farm jigsaw and sheep stuffed toy from my mum and dad. The little butterfly stool was from aunty Becky who found this little treasure in a charity shop in Dundee- very Kirstie Allsopp. The presents Craig and I bought her didn't even get opened as she was in a state of overload. Setting the dinner table was a rushed affair, which was a shame as it is a job that I enjoy taking my time over. 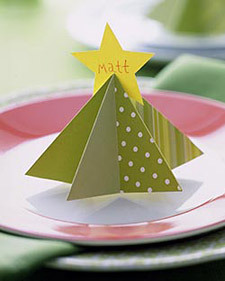 I wanted to make some Martha Stewart place cards, but it was not to be. I had to get up in the loft to grab Freya's old high chair so we would have enough seats (and I still spent dinner perched on our step-stool). The room was full of washing, push chairs, outdoor gear- not exactly Martha Stewart but Craig had done himself proud with the rib of beef once again. The kids went down like clockwork after having a play with their new bath toys. Mum and dad disappeared off home to sort Benson and Buster out. Mum hadn't been so well and dad tends to avoid gatherings since becoming tee-total. That left the Chambers's. The front room looked dreadful but we managed to beat a path to our seats. Pat and I had a quick play with Freya's new doll's house then changed into our pyjamas. I always get PJ's and bed socks from Pat and I love it. The tartan bottoms fitted like a dream but the top made me look like a savaloy- oh well, I knew diet time was only just around the corner. I settled down with a Raspberry Martini to watch Dr Who- a very Christmas day thing to do. Unfortunately, this was followed by 'Whistle and I'll come to you'. This was supposed to be a ghost story but it turned out to be more of a cerebral 'mood-piece' meaning that I didn't really understand a lot of it and the rest of it made me sad. The only scary part was a pair of hands coming under his hotel door. My mum had said it was alright- earning herself a poke in the eye next time I see her. And I guess we're all done for another year.